U.S. 6 follows Interstate 74 across the Iowa-Illinois Memorial Bridge to the freeway end at Quad City International Airport. 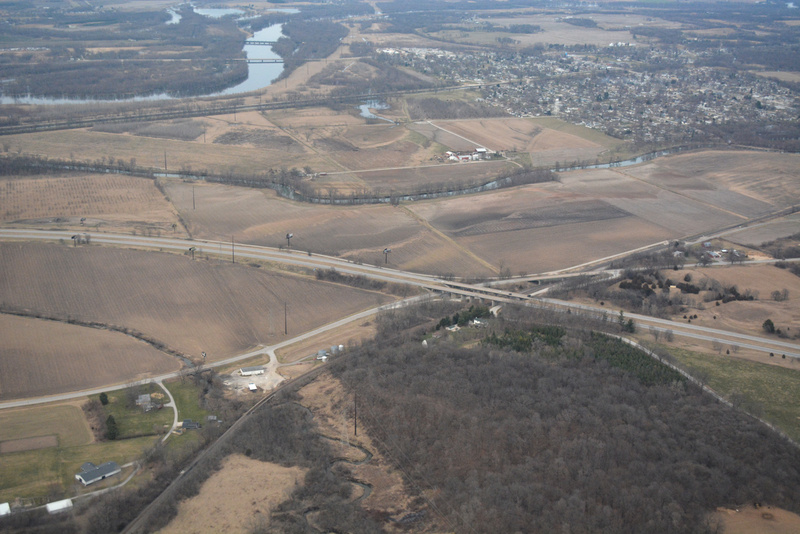 The US route parallels Interstates 74 & 280 along a two-lane road from the airport to Colona. U.S. 6 travels 180 miles across northern Illinois, paralleling the Interstate 80 corridor from the Quad Cities east to south suburbs of Chicago. The route initially enters the state along side I-74 across the Iowa-Illinois Memorial Bridge, traveling south with the freeway through Moline to Quad City International Airport (MLI). The remainder parallels Interstates 74, 80 and 280 east from Coal Valley to Peru, La Salle and Joliet. The eastern most extent of U.S. 6 in Illinois combines with Interstates 80 & 94 along the Kingery Expressway, from Torrence Avenue in Lansing to the Borman Expressway in Hammond, Indiana. U.S. 6 passes under Interstates 74-280 along side the BNSF Railroad west of Colona. Photo taken 03/11/17.